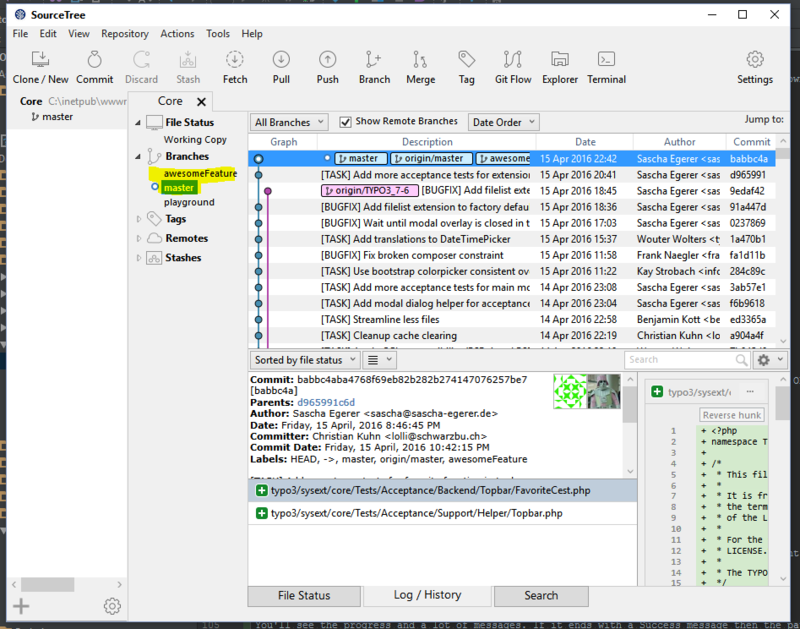 In order to use SourceTree in Windows PuTTY should be installed and your SSH key loaded into pageant (see Create SSH key on Microsoft Windows). 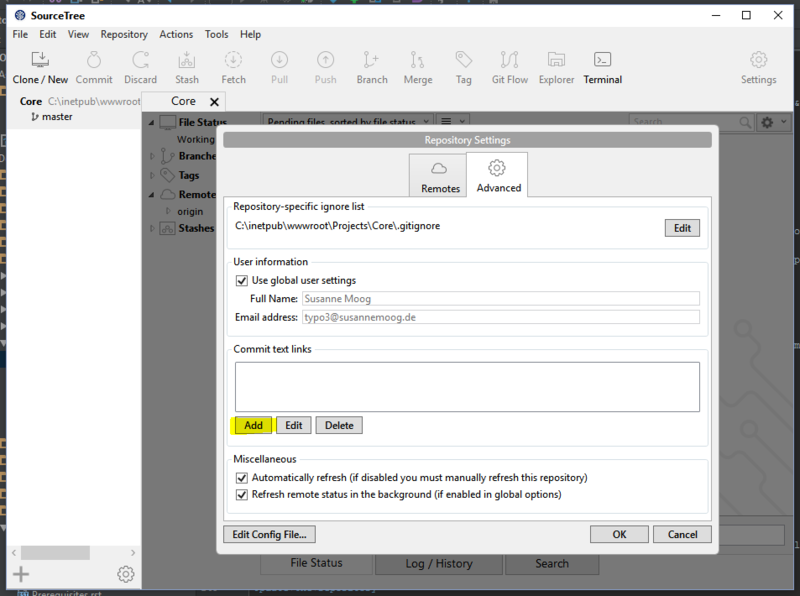 First of all set the basic settings for your Git configuration by clicking on the settings button in SourceTree and add your name, email and SSH Key. Make sure the option "SSH Client" is set to PuTTY/Plink. To clone a new repository click on "Clone/New". 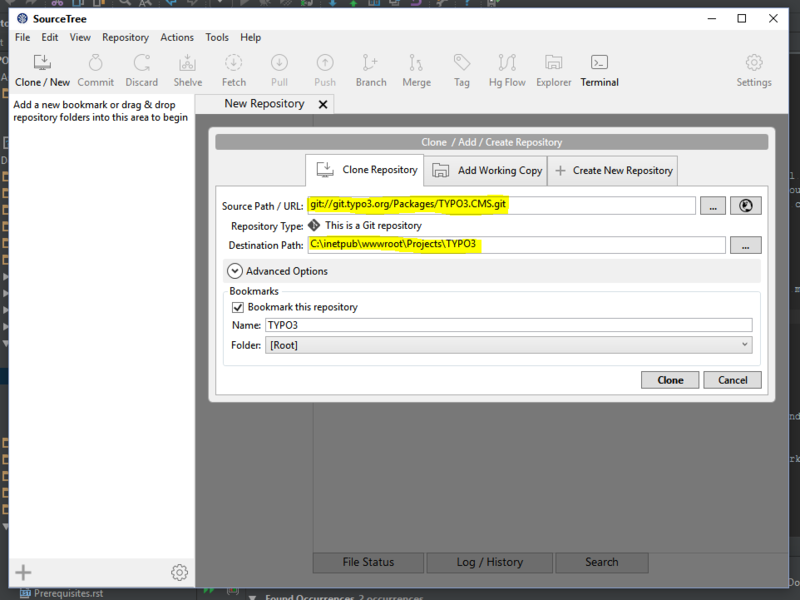 Enter the URL to your repository and the path to your local folder. For easier access to your repositories leave the bookmark check box checked. Click on Clone. 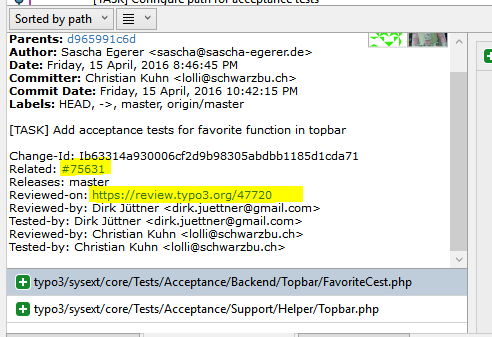 Checking out the full TYPO3 Core repository might take some time, please be patient. First visit the page of the patch in Gerrit. From the Download menu, choose the copy button after the 'Cherry Pick' line. The patch is now applied and you can start testing. You can read about the why and where of the pre-commit hook here. In the Git Bash window (click Terminal), enter the following commands to set that you push to Gerrit instead of the TYPO3 repository directly. It's easier to undo all the changes in a patch if you create a branch for it. 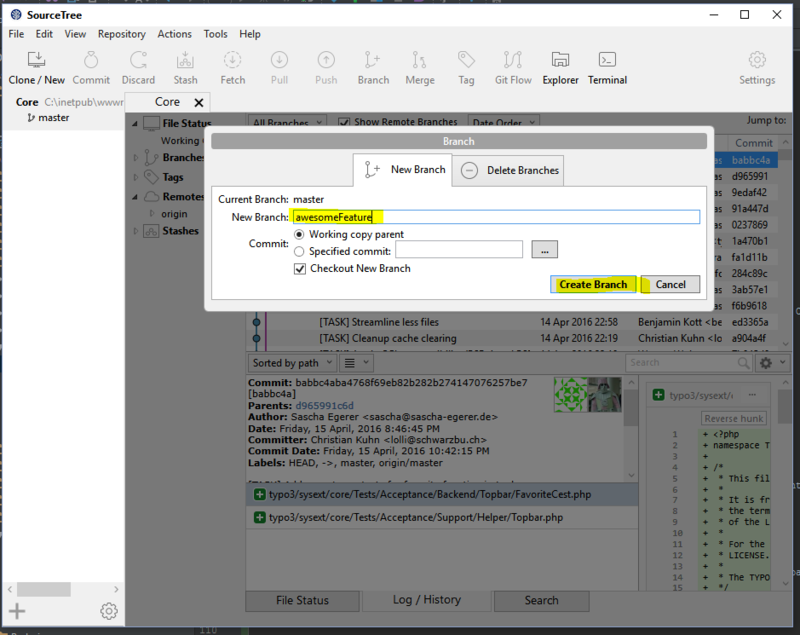 Click on the branch button and enter a name for your new branch, then click "Create Branch". 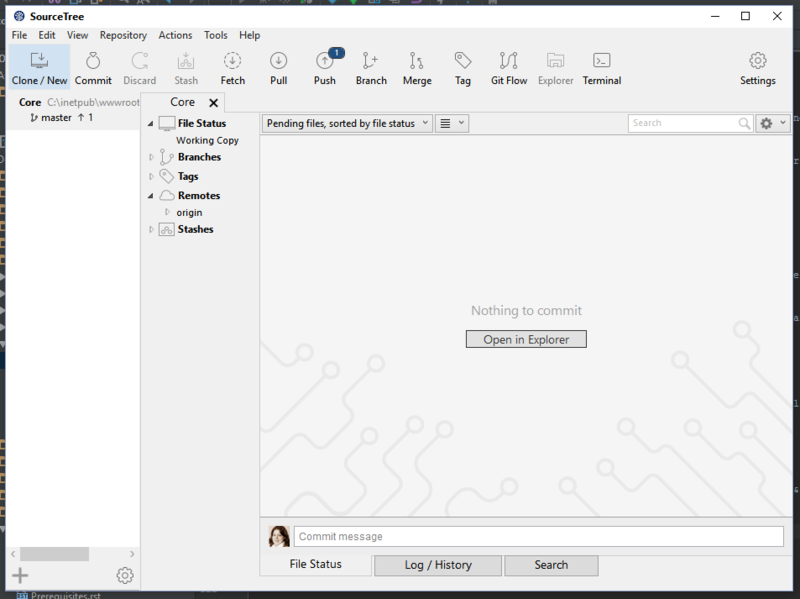 Now start coding and commit your changes (By pressing the "Commit" button). Make sure your commit message is written according to the >>>rules for the commit message<<< and click OK. Your changes are now stored locally in a separate branch. Click the "Push" button to open the push dialog. 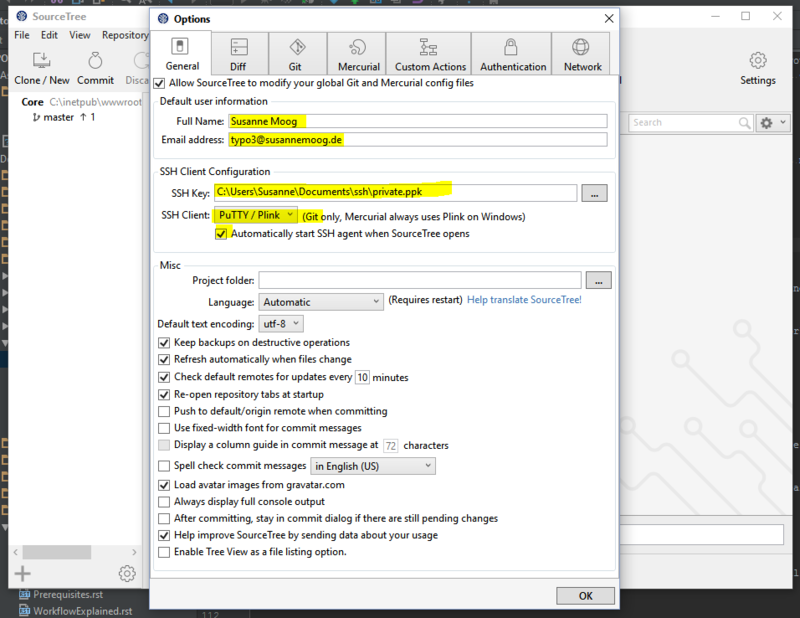 Check the checkbox in front of your feature branch. 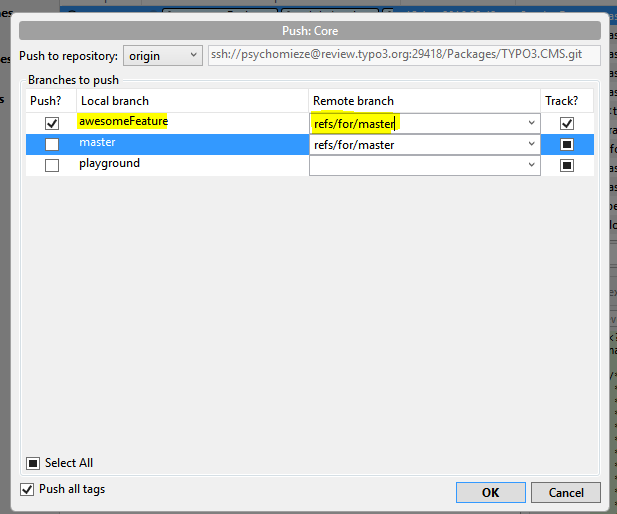 As remote branch add "refs/for/master" - which will create a new patchset for master. If you want to create patches for older branches use 'refs/for/<branchName>', for example 'refs/for/TYPO3_6-2'. Be aware that you have to fix a bug in master first before it can go to older branches. Now click ok. You should get a Gerrit link to your new change in the resulting output. To get back to master just click on it at the "Branches" section. 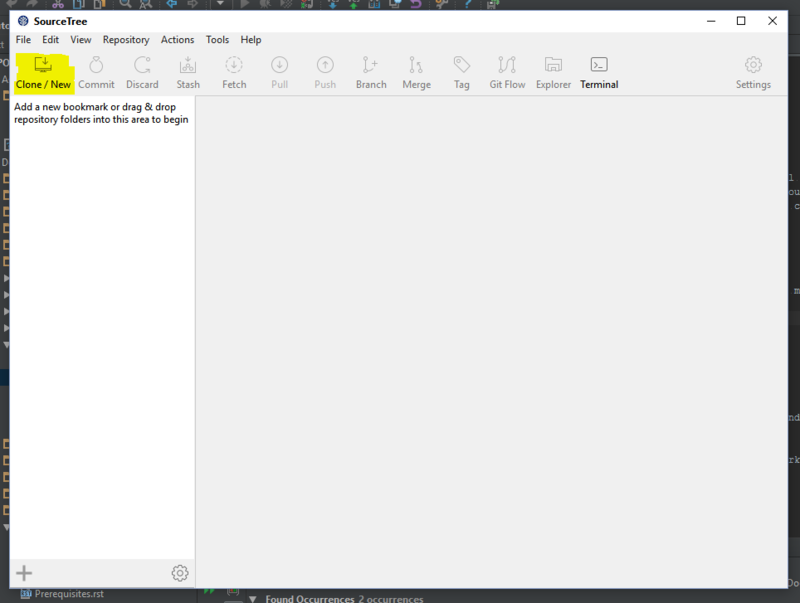 If you want to delete your feature branch, right click on it and choose "Delete".